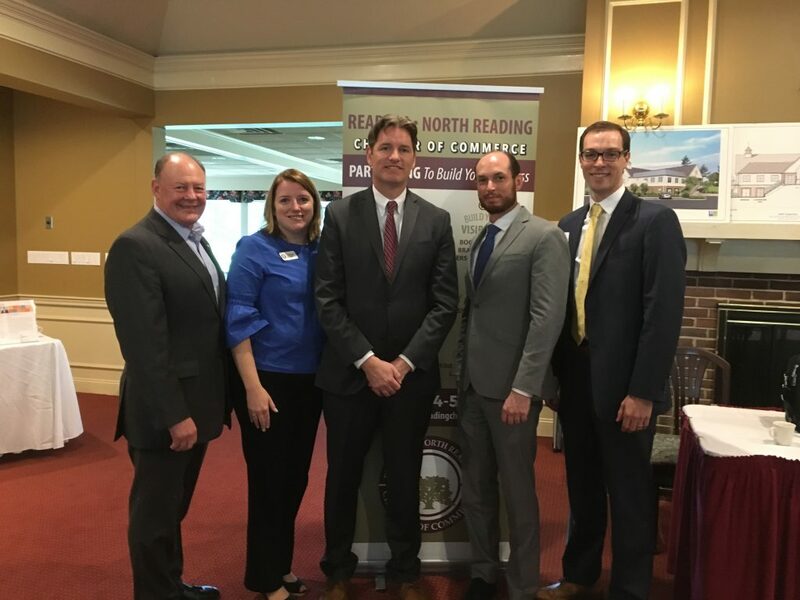 Ruberto, Israel & Weiner Employment attorney David Robinson moderated a panel about the recent “Grand Bargain” signed by Charlie Baker, for the Reading Chamber on September 26, 2018 at the Meadowbrook Golf Club located at 292 Grove Street, Reading, Ma. The new legislation includes a jump in minimum wage as well as a new employer funded medical leave package. This panel discussion featured stakeholders, business owners and employment industry professionals to review what the new law means for employers. The panel included Pat Lee, Owner of the Horseshoe Grille and Chairman of the Restaurant Association of MA, Christopher Carlozzi, State Director of the National Federation of Independent Businesses (NFIB), and Ryan Kearney, Retailer’s Association of MA, General Counsel. Picture from Right to left are: Pat Lee, Owner of The Horseshoe Grille and Chair of MA Restaurant Association, Lisa Egan, Executive Director of the Chamber, David Robinson Esq, Ruberto, Israel & Weiner and Panel Moderator, Christopher Carlozzi, State Director of the National Federation of Independent Businesses (NFIB), and Ryan Kearney, Retailer’s Association of MA, General Counsel.